West End Target the Tour training is a ride for all cyclists who have enjoyed the Ardrossan TtT but are looking for rides closer to home. 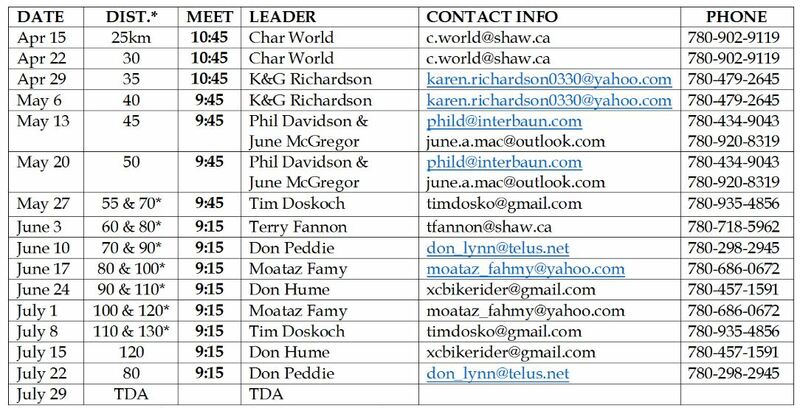 The West End rides have various starting points anywhere between the west end of Edmonton, Spruce Grove, and St-Albert, so make sure you keep an eye on the website. 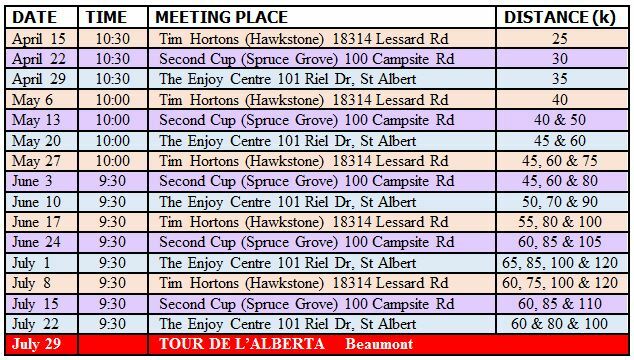 These Sunday morning rides enables riders to prepare for the Tour de l’Alberta or other longer rides (or just get into good cycling fitness condition). It is a progressive ride that builds rider endurance. A focus of each ride will be safe riding. Bring your well-maintained road bike and cell phone for an enjoyable tour on good roads with some rolling hills. Beginner to intermediate riders welcome! There will be a sweep and maps provided. 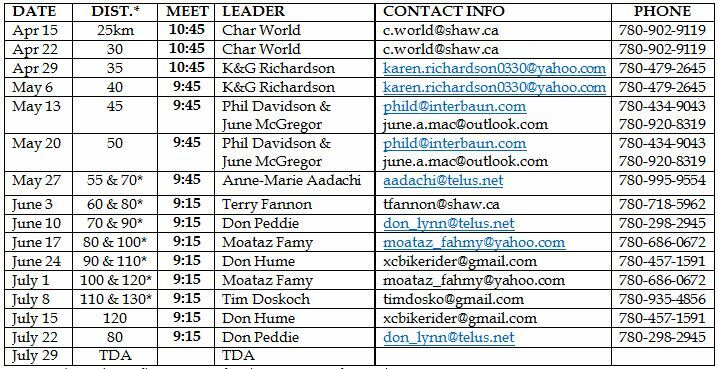 West End TtT rides will start April 15 at 10:30 and will run weekly at rotating locations indicated below. Notice change of start times as the weather gets warmer. Please be ready to ride 10 minutes before ride time. NOTE: These are approximate distances!! Various options, extensions or cut-offs will be discussed at every ride. For general information about the West End Target the Tour Training, contact Danielle Amerongen at damerongen@me.com.